Selection of canine flea control treatments which help keep your dog flea free through out the year. It's important to remember that every dog is an individual so what works on one dog may not work as well on another - so sometimes you may need to a try a couple different dog flea control treatments before you find the one that works best on your dog and home environment. You may also need to not only treat your dog, but your home and your outside yard. Also don't forget to maintain regular canine flea control all year round, I put a little reminder on my calendar when its time to do my little doxie so she stays flea free. This is a topical flea and tick preventative for dogs and that is given monthly. Kills adult fleas, mosquito's, ticks and lice. This product is waterproof so good for dogs that like to swim. Takes about 12 hours to work on fleas and 48 hours for ticks. Safe to use on puppies over 8 weeks old. Consult your vet if your dog experiences any side effects. This canine flea control is a topical preventative for use on dogs only and it has the advantage of not only killing adult fleas and ticks but also repels them and also mosquito's,ticks and flies. This is effective against all life stages of fleas, kills flea in 12 hours, provides one months protection. Safe to use on puppies over 7 weeks. The repelling action is important as it helps stop the transmission of diseases. If any side effects continue, consult your vet. A successful single dose treatment that kills adult fleas on dogs and cats. Fleas on dogs will die in 4 hour and fleas on cats in 6 hours. A more reasonably priced topical flea and tick product that is safe to use on puppies from 8 weeks old. Kills fleas, ticks, eggs, larva and lice. Seems to work on some dogs but not so well on others but at this price it is worth a try. This unique comb most users find works extremely well. But if you have trouble with the fleas escaping just when you thought you had caught them in the comb. Try dipping the comb in a cup of warm water to drown the fleas. Ideal to use after bathing your dog. This oatmeal dog shampoo with Pyrethrins, kills fleas and ticks. Soothing for dogs with irritated skin. Suitable for dogs over 6 months. Zoecon Precor 2000 Plus Premise Spray, 16 oz, Price around $19. This is a water based flea control product for use in the home, it is dispensed as a fine mist which penetrates well into carpet and upholstery fabrics. Most owners who have used this product rate it highly successful. 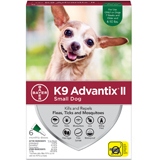 Kills adult fleas fast and prevents re-infestation for up to 7 months. A powerful flea and tick control spray excellent for use throughout your home especially on furniture and in those out of the way places. Kills active infestations of fleas and stops re-infestation for 7 months. Covers approximately 2000 sq ft. Not for use on or near pets. Many owners find this product effective as it aids in the prevention of re-infestation of your dog. Easy to use, just attach sprayer to end of hose for convenient coverage of up to 6000 sq ft. Product does not cause any damage to grass or foliage. Effective against fleas and ticks in your yard. 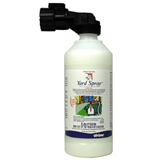 This is an effective yard spray that is easy to use, kills and repels fleas, ticks, mosquito's, ants and others insects. Works out a bit expensive if you have a large yard or you need to re spray through the summer. Does not harm lawns, shrubs or flowers, treats approximately 5000sq ft.